How exactly are we different from others? This blog has served as a platform for us to clarify a lot of the questions that do the rounds regarding this initiative. This post is just another one of those. In the past few weeks a lot of questions have popped up in front of us, asking us why we are different from the other social networking sites that have come up related to JMI in recent times. I would not like to divulge any names but would like to put the comparison in the form of bullet points. Yes this is no business. It never was, is and will never be one! Agreed we need money to power it all. Money to compensate for the thousands we have already shelled into this project and the thousands we will in the coming days and months. And we need a way to fund that. Having said that we aim at making no money out of this. It is all being done for the love of the institution. There are no vested interests. In case one of these days you realize that the information you provided to us has been wrongly used, I give you full authority to try me or any other member of the team for the same. Its not stupidity in my opinion but the confidence we have in our goodwill. A couple of sites and their strategy puts us into a fix. If you might have noticed, our branding is totally based on the JMI logo. A logo we love! Rest assured we have some of the best graphic designers out there to design a logo for us but the prospect of designing one never appealed to us. An alumni for us passed out of JMI and not from a random organization we build out of thin air. Hence its only obvious that we give him/her what he/she left behind. Makes more sense as we are no business. Everything that is on the site is in front of you. We do not harass you into signing up to be able to see what the site is made up of and what all it can provide. I for one am a staunch opposer of such cheap tactics and made sure we do not have a login and registration form welcoming users on the site. What we have is what you get. We have more for you, a LOT more! People thought the blog was good. Then off late they have been thinking that we probably maxed out with the Community site. But as they say the best is yet to come. And we are diligently working on the next big thing already while making sure the current components are advertised and marketed properly. Our target audience is clear. FET it is! No plans of serving the entire university. A couple more things that are in the works currently but discussing them here could probably jeopardize our prospects. Hence I would not discuss them just yet. One of these days if all goes well I will be the first one to blog about it. It might sound like a useless post this to a few. But I have always believed in keeping my slate as clean as possible. This another one of those attempts. Community Website: Its time to reconnect! We finally managed to pull up a stunner of a release at 9:50 PM IST yesterday. A quick snap of us and the 50 odd students who showed up at room number 104 of B. R. Ambedkar boys hostel to support this initiative. We are extremely happy with the support and appreciation we have received so far. It makes us realize the need for us to improve and do better in this effort. Thank you so much one and all. A special mention here of Amit Xavier, founder of Glimpse Creatives, who supplied us with a beautiful JMI logo just in time for the release. It is worth mentioning that this is the first 3-D logo of JMI that we have on record. Amazing! Registrations for the Community site are now open. Register right away and start networking with your batch mates. Its time for us to make the world realize what we are made up of. Long live Jamia Millia Islamia! In case you want to read the official mail released to our mailing list, please visit this link. You can also subscribe to our mailing list for regular updates here. The site, yes yes the much talked about community one is due for release tomorrow night. Details below. You can join the event @ Facebook here. I so wish we could do a livecast of the same for all the alumni members who cannot attend it. But so is life as I always say. True to our Indian genes, we are running around like crazy retards in the background to make sure there are no leaks visible when we go live tomorrow. Seems pretty solid at the moment. Hope to see you soon on the other side of the password protected directory. Wish us luck! I think we could increasingly focus on making this an alumni database rather than a forum addressing issues and stating facts which although essential but need to be limited to the knowledge of the alumnus of the college only. If I understand the purpose right, then I think what we are focusing on is educating people (and maybe prospective students too) about what they ARE missing by not being a part of the institute when it comes to recruitment/admission and NOT what the institute is missing. Having said that, in my honest opinion only, I feel that you should have partitioned spaces, one strictly for the members which would include only the alumni and the present students and they alone could have access to the blogs. For all and sundry, as your viewership increases, we would be more interested in facts. Facts about the college (not expressed in the form of a blog), about the societies, about the initiatives, about the companies visiting and most importantly about where it’s students are. Much to my dismay, prior to and even now after registering for this site, I could not see any link which could lead me to the list of members who have already registered. While registering also, the form did not seem to have any details asking for the whereabouts of the person (which should have actually been your point of attention), considering that a good number of people have already registered. How are you benefiting if the alumni are not being made to share their details? Had I been a visitor or I show this to my friend, I would first ideally like to see who the people are who make this institute (and not the people of who make this blog; no offense intended), who were fortunate enough to have studied here and where they are now. I understand that the site is still in its nascent stage and maybe each one of you is brimming with ideas. I’m sure that true to Deep’s status, JMI FET shall be the next big thing soon enough. Once again, congratulations on the initiative taken. I hope the team does achieve the purpose of fetching FET JMI, it’s much due credit and a place right under the sun. As a last piece of suggestion, (I bet you hate me already), you could also contemplate creating communities on this site maybe with respect to departments or the batch year so that there is more active networking which is actually the need of the hour. Firstly thanks a lot for blogging. Its really appreciated. I really liked the fact that you took the initiative to blog and speak you heart out on this initiative of ours. Let me take the liberty on behalf of the entire team to try and answer the concerns you have put forward to the best of my abilities. What really is the agenda of this blog? Frankly its still a bit hazy. See it this way. For years the JMI FET community has remained silent at large. I still don’t know of one public forum where we guys, both the current students and the alumni can get together and pour our heart out the way we have done here till date. Now that we found something we started punching in every thing that we had i.e. views and news all at once into one common platform. At the same time we want to make sure that the alumni feels a connect with the college by being updated how we are doing currently in terms of admissions etc. Rest assured over the next few weeks/months everything will be categorized very cleanly and we will leave this blog venting purposes only. What’s with the registration debacle on this site? Well we know its simple. Intentional attempt of ours actually to make registration real straight forward for all in coming alumni members. The actual jewel in the crown i.e. the community site is under construction. Infact we are into heavy testing mode and we are hoping to release it soon, very soon. It will have everything that you talked of here. Infact as a token of thank you for the hard work you put into writing this blog I would like you to beta test the site with us. I have emailed you the details separately. Do we hate you?! No! In fact I personally love you for the blog you just wrote for us. Hope you understand the context in which the word ‘love’ he been used here. On the contrary I feel that I might have been added to your hit/hate list for having published this blog post despite your explicit statutory warnings of not to do so flashing all over the article. Genuinely sorry if I offended you in doing that but I so wanted the readers to see what you had written. P.S: I have read you blog talking about the various minute details of the ECE Department. Been a big fan of it for some time now and made a lot of others read it as well. Lets take that up on a personal level though! This is the land of my hopes !! This is the land of my dreams !! What is Jamia Millia Islamia ? What is its purpose ? Is it serving the purpose of its foundation ? These are few questions which come to my mind when I think how to make this initiative a success. To answer these questions I went back to something very basic, something which we don`t even consider our own. 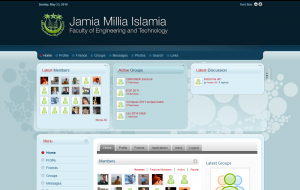 We don`t consider it to be part of Jamia Millia. Reading each line and feeling them makes me proud. It makes me understand the purpose of Jamia Millia.I`ve always been proud of Jamia Millia`s history. There is probably no other Indian institution which had to survive so much political opposition in its making without diluting its goals. Even the degrees awarded by Jamia were not considered valid in the time of the British. Jamia Millia was established during the Non-Cooperation movement. Responding to Gandhiji’s call to boycott all educational institutions supported or run by the colonial regime, a group of nationalist teachers and students quit Aligarh Muslim University, protesting against its pro-British inclinations and thus the foundations of Jamia Millia were laid. During my preparation for the GD-PI stages of B-School entrance process I had to go back to Jamia`s website, to Jamia`s history and then I realized Jamia Millia is different, it is different from every other Indian university.So many sacrifices had to be made just for the mere existence of the university. Now when you see campus,when you see inter faculty cricket matches at the Bhopal Ground with the Faculty of Dentistry in the background,when you see uth café which is so aptly named you got to believe that those sacrifices have been honoured. Our past is glorious & our future bright. No doubt about it.We know it. But our purpose is to make sure that others know it as well and acknowledge.We should strive hard to make sure that when we mention the name of grad college as Jamia Millia Islamia, we should be proud and the person in front should be impressed and that would be true reward for the innumerous sacrifices made for the existence of Jamia. No, Sachin’s still some time away from hitting his 47th ton. Well with a lot of cheap jokes about Sachin and his new Twitter account doing the rounds on the web, I thought I might just have a dig at him as well. Plus I got a great start to an even greater notification post. Now I would not want the readers of this blog who happen to be die hard Sachin fans to be offended with this useless dig. I want him to hit that 47th don just as badly as you. But its beyond the scope of discussion of this blog. So Sachin’s not hit a ton so who did? We did! Yes Yes Yes! We clocked our 100th user on the blog last sunday at 9:32 PM IST, barely 8 days after we flung open our doors to the world. Its quite an achievement I got to admit. Been a web administrator for a few years now but this is one of the highest registration rates I have seen till date. Thank you so much for supporting this blog in the way that you all have. I know what you are thinking. ‘OMG this is news! What on earth took you 5 days to publish it to the blog? !‘ In my defense, I was busy with my side business a.k.a. academics. It might sound as an unnecessary explanation but I like to keep the slate as clean as possible. Off I go now to crank up the community website. (Insider News: We are making some good progress on it). Have fun blogging or simply reading what others have written. I shall see you pretty soon! “Gabon (pronounced /ɡəˈbɒn/; French pronunciation: [ɡabɔ̃]) is a country in west central Africa sharing borders with the Gulf of Guinea to the west, Equatorial Guinea to the northwest, and Cameroon to the north, with the Republic of the Congo curving around the east and south. Its size is almost 270,000 km² with an estimated population of 1,500,000. The capital and largest city is Libreville.”- Wikipedia. I was always proud of my geography but I had to search about Gabon on Google Map & Wikipedia. It has been a week since we started the blog and we have statistics showing the mounting interest that the blog, and the website itself has created. We`ve had visitors from not only different corners of the country but from cities spread across the globe. The number of visitors has gone down over the period of last 7 days but since the website/blog is a long term project, I am not really bothered by it. I believe that with increasing the functionality of the website the number will definitely increase. The main purpose here is not to have very high number of visitors but to have a sustained number and to fulfill the requirements the website is being developed for. The idea of the website struck me sometime around August-September last year. I discussed it with Imran and we had thought about adding a lot of modules to the website. Now as we are up with it we are thinking about various new functionalities which we intended to expand the site over and also those which we`ve been suggested. We also need to look out for a financial model which will ensure a regular inflow of money to keep the website up and running. We have discussed various models ranging from donations from the alumni to the google adds. Now we are pondering over a few ideas and I would also like to invite suggestions for the same. Social Networking Module : A module on the lines of Facebook. A platform where the members can form communities and can communicate with each other. Communities like may be JMI_FET_NYC or JMI_FET_2005 or JMI_FET_CIVIL_MIDDLE_EAST. The idea here is not segregate the members but to integrate them under different banners and then finally integrating under the banner of JMI_FET. Job Portal : This has been the most important module ever since the idea of the website came up. We are discussing the feasibility of various models like Linked In or job portal sites like Naukri.com and Monster.com. This should cater to various requirements of the members. It should help the members in finding jobs/internships and it should also be an effective tool for recruiting an able candidate for an opening. Newsletter : Communication breaks all barriers. A post by a fellow alumnus mentions the feeling of being alien to the place. I feel this is because there is no communication. Once you passout of this place you rarely get back to the campus. There is nothing to remind you that you once belonged to this place. Alumni Database: An alumni database is also very important for a lot of different reasons. One of the main ideas behind the whole concept of this website was that once you know your alumni you can ask for thousand favors. I don`t know how many of these are technically feasible. But I believe with this team nothing is impossible. The team has vision, passion, enthusiasm, skills and finally the will to make it a success. There are many other ideas which I believe can only be implemented at a later stage. I request others to keep blogging and to keep giving feedbacks regarding the project. I`d also keep posting my ideas about how to take the project forward. And yes I had to search for Gabon because we had visitors from Gabon as well. One week on: How we doing? The famous lines by Joey Tribbiani sound so apt for this post. Been a week since we launched this Blog and its time for the analytics stats I promised. The first in line is the visits graph. Not very ideal. But then so is life. Huge start and a slight slump post that. The big positive here is that the opening day visits were 178(Applause!) which talks volumes about our marketing abilities. A big thank you to our alumni who forwarded our initial publicity mail to their contacts(Saleem Ansari, Samar Akhter and YKS are names that come to my mind right away. Thank you so much guys. And others too). Next in line site usage stats. Although the image says it all, listing it out here again for your convenience. My comments are attached to it as well based on my past experiences with site building and handling. Visitors overview talks of the total unique visitors in the past week and how they panned out as the week progressed. The tiny map on the right shows where these visitors came from. The countries shaded green are where the visitors belonged to. Darker the shade of green, more the number of visitors and vice versa. We have had visits from India, US, Saudi Arabia, Australia, UK, France, Gabon among others. And finally the visitor breakup across India. Quite a map I must say for a site that’s just a week old. The NCR is the biggest contributor as is visible from the map. Test your geography skills by locating the rest of the locations. Good luck! Thank you all for the interest you have shown in this site. As always its highly appreciated! Its time for some numbers, BIG numbers! Happened to receive the following article today from one of the JMI groups online so thought of sharing it with you all. The Faculty of Engineering & Technology, Jamia Millia Islamia (JMI) has received an unprecedented number of Application Forms for admission to its B. Tech. course in Civil, Electrical, Mechanical, Electronics & Communications and Computer Science streams for the academic session 2010-11. A total number of 29,289 Application Forms have been received against an intake of 350 seats which is a significant increase from 21,632 received last year. Part of the reason for this huge rush of applications is also the excellent placement record of the Faculty as also a good number of students who have qualified the GATE examination. The Entrance Test for B. Tech. is scheduled to be held on May 29, 2010 at 10.00 AM simultaneously at various centers located at Lucknow, Patna, Ranchi, Srinagar, Guwahati, Calicut including Delhi & NCR. This is the first time that the university is holding its entrance examination for these courses outside NCR. Further details of the B.Tech. Entrance Test may be obtained from the University’s website. WoW! That’s exactly what went in my head the moment I checked out the email containing it earlier this morning. These are simply mind boggling numbers. Numbers have always been my forte, mathematics has not. But a few basics of mathematics I picked up in my primary classes was enough to do some quick analysis of these numbers. The increase in the number of completed forms returned to the FET YoY is 35.39%!! The admission ratio comes out to be around 1:83 if we consider that all applicants will be appearing for the entrance examination. Not practically possible but a good parameter nevertheless to define how tough it is to get into this college. The above figure though is not completely correct. Here’s why. The distribution of applicants greatly varies among different sections of reserved categories i.e. Internals(JMI students), SC, ST, General etc. The general category certainly forms the main chunk of applications buts has just over 50% seats reserved for them. By my reckoning the ratio when it comes to this section of applicants i.e. General would be around 1:125(Personal opinion and not backed by any authentic source). That kind of competition I doubt exists anywhere in this country(Please correct me if I am wrong by posting a comment to this post)! The approval of the long pending decision of branching out to other cities for admission tests. For the first time ever JMI will be conducting its entrance tests for three courses i.e. 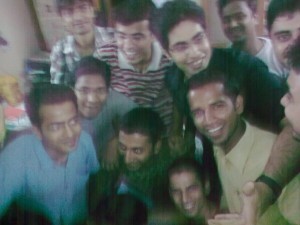 B.Tech., B.Arch. and B.D.S across 7(including Delhi/NCR) different cities which have been mentioned in the above quoted text. This is not a completely new effort as pointed out by Waseem via his comment(Thanks mate! ), but surely the number of cities has been increased this time around. Positive publicity across the NCR and nationally as well about the University has led to people realizing the opportunities the college possesses for them. Its a gradual process but is happening, slowly and steadily. I am sure there are more reasons to it. Let me know what else you think could have contributed to all this by commenting to this post. Or if you can’t think of any, just let us know what you think about this amazing development in general. As always we love to hear back from you, our readers! ooh nice! Can I blog too? That’s the query we have been receiving from a lot of users since we launched a few days back. Its an easy process but needs a bit of looking around to learn and get used to. No worries though. I just pulled up a quick video tutorial to help you with that. Have a look at it below! How to add your entry to the Blog? from Imran Ali on Vimeo. Excuses for the weird hiccups that you might find in the video. In my defense I would say I was probably suffering from stage fright. Thanks a lot for viewing the video. Hope it helps clear up doubts that you might have had regarding the entire idea of blogging. And an even bigger thanks for logging into this website and passing suggestions on our efforts. Really appreciated!